Got a ton of herbs growing in your garden? Then you’ll probably want to preserve them. I’ve been harvesting 5 gallon buckets of herbs for the past couple months, and drying them just isn’t doing it for me anymore. There’s only so many dry herbs one person needs! Herbs also have more than just culinary use, and there’s MANY more ways you can preserve them than just hanging them upside down and wait for them to turn crispy and dry. 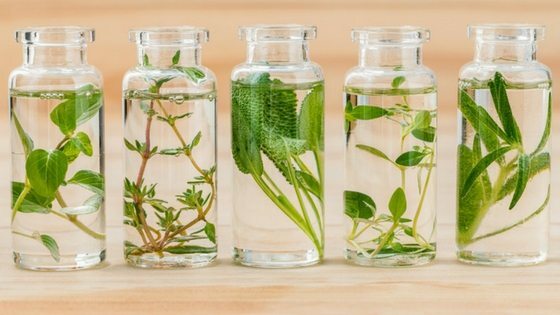 In this article, I’m going to show you 6 different ways you can preserve fresh herbs so they still taste fresh and so you can use them for more than just cooking. Preserving herbs in oil and then freezing them isn’t a new idea, but it works really, really well to preserve the taste. In an ice tray, pour oil (usually olive oil, but you can also use coconut or avocado oil) into each compartment and then add chopped, fresh herbs. Slip into your freezer and leave them there until needed for cooking. Did you know that you can preserve fresh herbs in oil and that it will be shelf-stable for much longer? Humans have been using oil for centuries to preserve herbs, and the oil takes on the scent, taste, and medicinal properties of the herbs. If you like the taste of basil on your pasta, but don’t really like pesto, add basil to olive oil (making sure to completely cover the herbs, otherwise they’ll mold). In a couple weeks, you’ll notice the oil start to smell like the herbs. If you like making your own salves, lotions, and lip balms, and want to use herbs to make them even better, you can use herb-infused oils. For example, if you want to use the skin-soothing properties of calendula or dandelion, soak the herbs in oil for 2-4 weeks. Then use the oil as you normally would in your favorite recipes. If you want to dry your herbs but don’t want to wait weeks (and possibly have dust collect on the plants or lose leaves if they fall off during the drying process), you can dry them in your microwave. Place herbs in a single layer without their stems on a on a paper towel, and place on a microwave-safe plate. The paper towel will help absorb extra moisture. Dry in 30 second intervals until completely dry. Store on your shelf in a mason jar and use as needed. Dry herbs CAN be used to infuse oils as well. If you don’t want to use a microwave, but don’t want to wait weeks, you can use a dehydrator like this one. If you want to hold on to fresh herbs for cooking or medicinal use but don’t need to preserve them for long-term storage, try this trick. Fill a mason jar halfway with water, and place your herbs, stem down, in the mason jar. Cover with a plastic bag, and secure the bag to the mason jar with twine or a rubber band. (Don’t seal with the jar lid and ring – leave them off). Store inside your fridge – the herbs will stay good for a couple weeks. This works because the herbs aren’t as exposed to air, and aren’t kept in an overly moist environment (like if you just kept them in a plastic bag and susceptible to condensation). Another genius hack to preserve herbs is to preserve them in salt. Like oil, humans have been using salt for generations to preserve food. Over time, the salt will take on the taste of the herbs. Place a layer of salt at the bottom of your mason jar. Then, layer a small amount of herbs. Alternate until the jar is full or you’re out of herbs. Store on a shelf until needed, but use within 1 year. Finally, you can preserve your herbs in vinegar (apple, white, wine, etc). Pretty much the sky’s the limit. Like oil and salt, humans have used vinegar for centuries to preserve food (and sometimes human bodies – yuck). To make your own herbal vinegars, grab a mason jar and fill it with your favorite vinegar (white is mine – good for salad dressings). You can add either whole or chopped herbs, but fresh herbs are best in order to impart as much flavor to the vinegar as possible. Remove any wilted, yellow, or funky-looking herbs before preserving the rest. You can use herbal vinegars in cooking or as a hair rinse (rosemary vinegar is great for your hair). Herbal vinegars also make a great gift.